This widely acclaimed selection is valued for its many fine qualities. It is heat tolerant, cold hardy to at least -40, resists bronze birch borer and leaf spot, and will grow on either wet or dry soils! In additon to all those qualities, it is a beautiful, fast growing tree. Creamy-white bark, with salmon pink tones, peels to reveal fresh new colors, eventually darking somewhat. 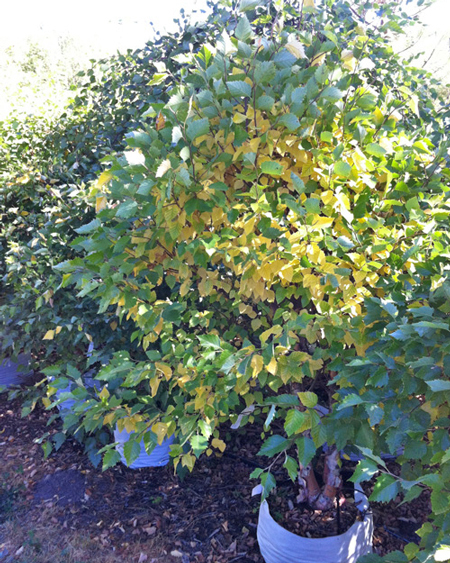 Lustrous dark green leaves are 3-4" long, warm butter yellow in fall. The tree has a full canopy, with graceful, slightly pendulous branching. A delightful choice.